Choosing Death Egg Zone from the level select will send you to this empty level, with no floors or anything. 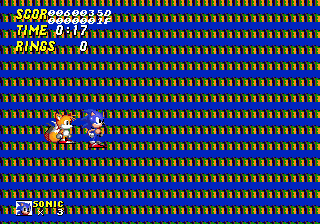 Sonic & Tails will simply fall to their deaths. This is because the level wasn't complete enough at the time, or possibly not sure if the level will simply be a final attack like it is in the final, or a full level. The background palette is from Aquatic Ruins Zone.